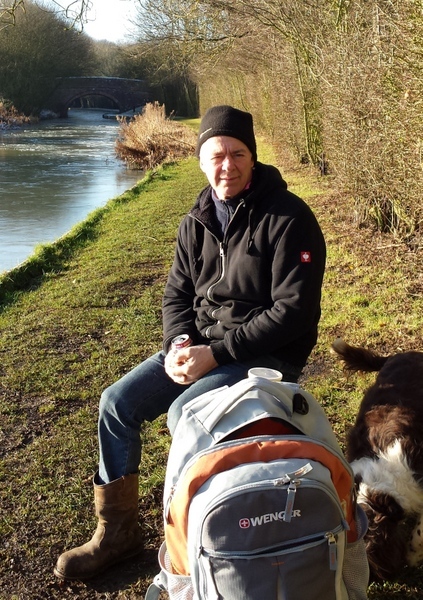 As you know from last week’s newsletter, on Monday I was stuck in thickening ice just north of bridge 22 on the Grand Union Leicester Line close to Yelvertoft. 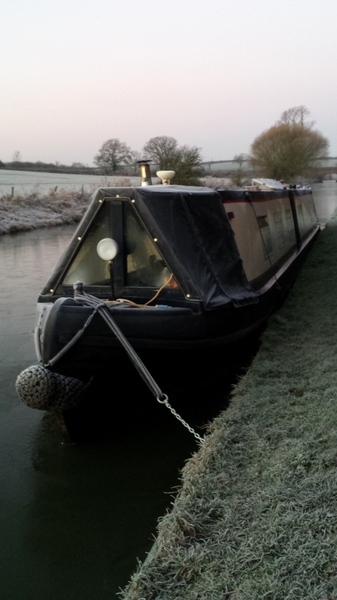 Our original plan was to stop for a few days at Welford junction but the ice stopped us in our tracks. I’m quite pleased it did really. We were forced to relax and enjoy ourselves rather than to try and score points for distance travelled. I say “we” were forced to relax, but I should say that “I” was forced to relax. Sally is always telling me to stop thinking about cruising for so many hours each and every day. I’m learning slowly. So on Monday we relaxed. After waking up in the morning, walking the length of the boat, hearing the hull grating on the ice as the boat shifted slightly and looking outside to confirm what we suspected, we spent a few minutes outside taking photo’s before returning to the warmth of the boat, throwing some more coal on the fire and enjoying a leisurely full English breakfast. After breakfast we sat in front of the roaring fire reading our respective Kindles. Sally is flying back to the Philippines on Tuesday for three months. She wanted to take a supply of books with her so she craftily bought me a Kindle Paperwhite for Christmas to replace my four year old third generation Kindle. if you’re a book loving boat owner, the Kindle is a wonderful way of storing an almost unlimited number of books on your boat. My old Kindle had a capacity of 3,500 books which, for most people, is a lifetime’s reading. I can only fit 1,000 books on my new Paperwhite but that still allows me to read a book a week for twenty years and keep all of them in the palm of my hand. The Paperwhite has a gently back lit screen so I can read in bed at night without disturbing Sally by turning the lights on for one of my increasingly frequent can’t-sleep-so-I’ll-read-until-I-feel-tired middle of the night sessions. The Kindle in general and the Paperwhite in particular has revolutionised my reading on board. I love it. It’s not as cold as it looks. I could have happily say there for hours. half to the Knightley Arms in Yelvertoft for a pint and a poo. Wherever possible we use public toilets for the serious toileting. Unfortunately the Kinighley Arms wasn’t playing ball. It’s one of the many country pubs struggling to make ends meet. When we cruised this route in June last year they were still offering food. Now the best you can hope for is a bag of gourmet crisps, if you can get in to the pub at all. On Monday, despite advertising on the door to the contrary, they decided to stay closed for the day. We took our waste food to Yelvertoft marina instead. It’s a peaceful enough spot, if you ignore the constant muted roar of traffic on the M1 two miles to the west. I suppose most people wouldn’t hear it but I’m very sensitive to artificial noise. One of the first things we noticed was several rather terse notices displayed around the site indicating the marina owner’s dislike of dogs, dog owners, or both. Dogs must be kept on leads at all times and Owners not clearing up after dogs will be asked to leave the marina immediately were two such notices. As a groundsman at a marina with extensive grounds and dozens of free running dogs I understand the need to control dog mess but these signs indicated a rather draconian management style. We were hoping to pick up a few bits from the marina chandlery if they had one but the office was closed so we used their toilets instead then headed back to the boat for more reading in front of the fire. On Tuesday the ice was thicker so we knew that we were stuck for at least another day. There was no desperate rush to get going but I was mindful that, with our rather small seventy eight gallon water tank, we would need to move the following day regardless of the ice. Tuesday was a great day for dog walking. The air was crisp, the ground was firm underfoot and there was a little warmth to the winter sun. We headed north along the Grand Union towards Welford junction for an hour, carefully walking around half a dozen recently excavated badger setts in the towpath in one spot, before sitting for an hour in the sun on a convenient canal-side wooden bench while we eat an early lunch of satsumas, Pringles and diet Coke watching nothing much at all in the frost covered fields next to the canal. Back at the boat, Sally decided to cut Daisy’s coat. She’s a pure bread cocker spaniel, Daisy, not Sally, but she resembles a not-so-small and very fat bear if she isn’t clipped at least every couple of months. As clipping her costs in excess of £40 a time, Sally does it herself. Her coat was so thick that Sally gave up with the dedicated dog clippers and used my hair cutting clippers instead. I suppose it’s a punishment for me giving myself a number two cut while Sally was working nights a couple of weeks ago. A full cut takes Sally two hours normally but with her coat so thick, cutting through it took far longer than usual. After an hour and a half we decided to walk to the pub leaving Daisy with a comedy left hand side only cut. The Knightley Arms was open for business when we arrived at 2pm but there was just the two of us in the lounge bar and a father and his five year old son playing pool in the public bar. New Year’s Eve was another cold and frosty morning but the forecast was for steadily rising temperature throughout the day, melting ice and the chance of us moving on. Moving was now a neccessity for us. We had enough water left in the tank to fill a bath for a very small flea, and enough space left in our cassette for a tiny little wee each. The gods were kind to us on New Year’s Eve. Actually, it was the hire boaters which were kind to us. My boat-passing-early-warning-system sprang into action at 10am when an email arrived from Steve moored on NB Adagio in Yelvertoft marina. He had just seen a hire boat cleaving through the ice at speed and heading in my direction. Forty minutes later I heard the ice cracking while the hire boat was still two hundred metres away from us. By the time he had ploughed his way through the ice to where we were moored I had the engine started, the bow mooring rope untied and the mooring chain hung up in the engine room. The couple on the boat’s cruiser stern waved as they passed. They probably smiled too but their scarfed wrapped heads hid all but their eyes. I was so busy watching the hire boat passing that I didn’t notice the privately owned boat cruising in their wake. The second boat was moving quite slowly but still caused enough of a surge to rocket my boat forward and snap the single remaining mooring chain on the stern like a thin strand of cotton. Yet again, I’m delighted that I carry spares with me. I have two spare mooring chains, a spare mooring pin and even a spare lump hammer. The last thing I want after a long day’s cruising is to discover that I can’t moor securely. After retrieving my broken chain, I slowly followed behind the two much more quickly moving ice breakers. I had to cruise for an hour to the nearest winding hole to turn round and then head back towards home. The cruise was delightful. The sun bounced off the tumbling shards of ice pushed gently away from the boat by my inch high bow wave. I could hear the ice tinkling as it broke above the engine’s gentle murmur. Turning at the winding hole was an interesting exercise. The two boats ahead of me had cleared the way on the main channel past the winding hole but not into the opening itself. The bow glanced off the ice as I tried to turn into the opening so I had to move the stern as close to the broken ice as possible then use quick bursts of throttle to create turbulence under the ice to break it. Once I had created a bay of broken ice with the propeller wash, I was then able to reverse the boat and then swing the bow into the bay and break enough ice to turn. The real treat of the morning was the buzzards. I saw a lone bird soaring above the boat at first. Then it swooped into a canal-side oak, tumbled over another perched on a high branch and wrestled in to the ground. Both launched themselves from the ground and joined two more in the middle of a ploughed field next to the boat. Did you know a group of buzzards is called a wake? The sight was a real treat and a great way to end the year. We arrived back at the water point in Yelvertoft two and a half hours after we set off to find water gushing from the base. Fortunately only one of the pipes had burst so half an hour later with a full tank and Sally’s cursed washing machine droning away again, we carried on for ten minutes before tying up quickly at the nearest suitable spot so we could walk back to the Knightley Arms for our last pub pint and poo of 2014. I don’t hold out much hope for the Knightley Arms. At 3.30pm on New Year’s Eve, once more there was just us and the father and son pool players. I imagine that they were barely taking enough money to pay for the fuel for the welcoming fire blazing in the lounge. Mindful of the failing light, we hurried back to the boat and set off to look for a decent mooring before dusk. We reached Crick and stopped at a decent spot on the towpath between Crick Marina entrance and Crick Wharf. And there we stayed for our New Year celebration. We dined on ribeye steaks, spicy stir fried asparagus and creamy mashed potato washed down with a bottle of Chateauneuf Du Pape. As usual, we failed to make midnight, not that either of us particularly wanted to. We were both asleep by 10pm but up at 6.30am and cruising by 8am. We had negotiated Crick tunnel by 8.30am and were at the head of the Watford flight just after 9am. We were there, but the lock keeper wasn’t. I can’t say that I blamed him. There was a stiff breeze blowing above the top lock so with the wind and the close proximity to the M1, A5 and West Coast Main Line, it wasn’t the perfect place to recover from the previous evening’s excess. Of course we had the flight to ourselves so with Sally working up a sweat on the paddles and with me making a muddy mess of the roof climbing out of the locks to help her, we were through all seven locks in just over half an hour. We stopped on the forty eight hour moorings just below the flight so we could visit Watford Gap service station to take advantage of the facilities. What a different world. Even on New Year’s day, the service station visitors looked stressed, hung over, or both. Both Sally and I were on the receiving end of more than one disapproving stare from well dressed fellow travellers seeing our thick winter wear and mud streaked trousers and boots. I suppose most of them didn’t have the faintest idea that a canal with a maximum speed limit of four miles and hour passed a stone’s throw away from the country’s oldest motorway. 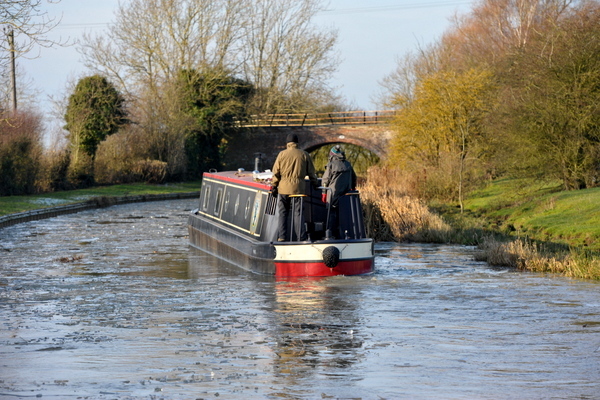 Back on the tranquil but increasingly windy canal we did a bit of surprise ice breaking passing the dozen moored boats just before Norton junction on an otherwise ice free canal, made the turn, followed an erratically zig-zagging elderly couple of boaters before they pulled over just before Braunston tunnel, entered the tunnel and then, of course, met the first boat of the day coming from the opposite direction. It was a light blocking high bowed working boat. I’m always amazed how little room there always appears to be either side of me when I’m on my own in the tunnel and yet how easily two boats can pass when they both take their time and keep over to the right side of the tunnel. I’m pleased that I had taken the time to remove my stainless steel chimney before we entered the tunnel otherwise I would have lost it. My stove is on the boat’s starboard side so with the boat hard up against the tunnel wall, the chimney would have been dragging against the roof. We stopped for a late lunch of toasted ham and cheese sandwiches above the Braunston flight then in increasing wind entered the top lock. We had five of the six locks to ourselves but met a boat coming out of the bottom lock so the gates were left open for us. While I worked the boat through lock thirteen of the day, Sally nipped in to the canal-side shop to buy a well deserved ice cream for both of us. Of course I can’t multi task so when Sally handed me the unwrapped mint Magnum as we were leaving the bottom lock I managed to smear the chocolate down my front and the boat’s bitumen down the side of the wing wall. I’ll never learn. The day was windier still as we cruised past The Boathouse, powered around the junction to combat the breeze and headed at forty five degrees along the embankment and then past the garden moorings at Wolfhampcote. It was there that we decided enough was enough. We had managed an eight hour cruise, thirteen locks and two tunnels on the first day of 2015 but with the light failing and the tops being blown off the waves marching towards us along the cut we decided to call it a day. One of the many aspects of cruising I love, especially cruising in inclement weather is that, no matter what the weather’s doing outside, inside is warm and dry and cosy. We spent a thoroughly pleasant evening sitting in front of the fire, lulled by the sound of the wind, the gentle rocking of the boat and the flames flickering in front of us. What a wonderful way to spend the first day of the new year. The following morning we were off by 8am and back in the marina by 10.30am. I’ve said it before, but I’ll say it again. I think the two marinas at Calcutt are wonderful. They’re spacious, beautifully landscaped and very comfortable indeed but, to me, turning in to the marina entrance was like driving into a crowded housing estate after enjoying the space and freedom of walking in the Lake District. In a way it was good to get back to the ease of living plugged in to the national grid with all the facilities and utilities we need close to hand, but it’s not terribly exciting. I can’t wait to set off again. I’ll have to wait but I don’t have to wait terribly long now. Just eighty seven days to go. The time is flying by. Sally flies to the Philippines the day after tomorrow. She returns on 2nd April, my 55th birthday and my release from full time employment. As soon as I finish work, I have ten consecutive discovery days to do, then ten days to touch up the cabin paintwork, and that’s it. We’re off! It’s going to be a happy new year for Sally and I. I wish you one too. Robin is a couple of years away from narrowboat ownership. 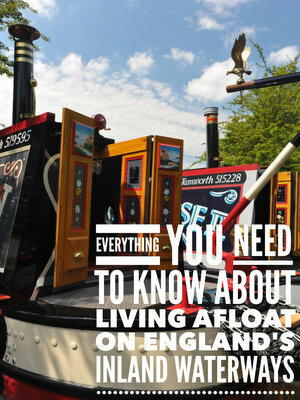 The purpose of his day out with me was to gain confidence in narrowboat handling. In the feedback he gave me he mentions “near misses and not so near misses”. Although Robin was very apologetic about sending us off course on a couple of occasions, his momentary lapses in concentration were quite usual for a first-time boat handler. The benefit in this case of course was that he had me standing next to him at the time so I was able to quickly and easily correct the error. One momentary off course lapse resulted in us collecting a little weed on the propeller but, rather than the weed being a problem, it was an opportunity to demonstrate the function of the weed hatch. All in all, it was an enjoyable day for both of us. “Before answering your questions, I’d just like to say thank you for your hospitality and the warmth of your welcome. I guess life can be full of adventures if you are prepared to go out and look for them. For me Friday was such a day. 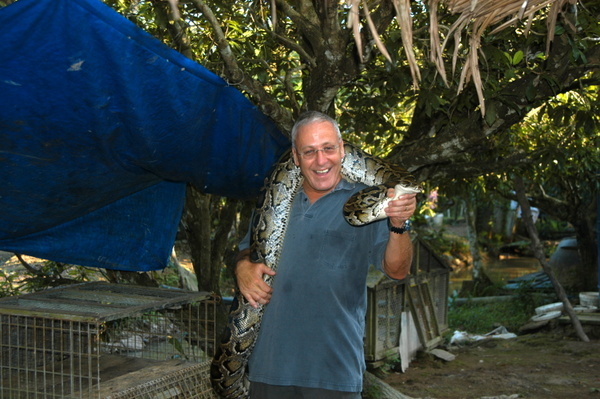 The last adventure, similar in kind I had, was eight years ago when I helped crew a yacht from Malaysia to Vietnam.In my mind I have been going over the events of the day and the near misses and the not so near misses. In particular the one where I had you wrestling to regain control after I had sent us veering off towards an oncoming narrow boat and the opposite bank of the canal. I believe I owe you an apology – it was unacceptable even in jest to suggest that you were responsible for steering us into the reeds. If it hadn’t been for your quick thinking and lightening reactions the situation we found ourselves in could have been much worse. So thank you and please accept my apologies. Now that I’ve got that off my chest, the day was truly fantastic. As I’ve already said, it’s been a long time since I have had such an adventure and enjoyed myself and learned so much. When I read about the length and weight of narrow boats in general I wasn’t sure if I had the right skills to master the handling, but under your expert tutelage you have given me the confidence to know that with care and practice I should be able to cope. In hindsight I am glad I accepted the challenge and believe now that many of my fears have no real substance in reality – so again thank you for that. It may be eighteen months before I am in a position to purchase a narrow boat of my own and there is a lot of research I will need to carry out before then. I guess for me the day was more about building confidence rather than information gathering. Friday was the first time I had been on board a narrow boat and given my height, I now know that life on a narrow boat would not be too uncomfortable. You can find out more about my discovery days and availability here. Please note that there are just four dates remaining for April now so if you want to spend a spring day out with me you need to book quickly.